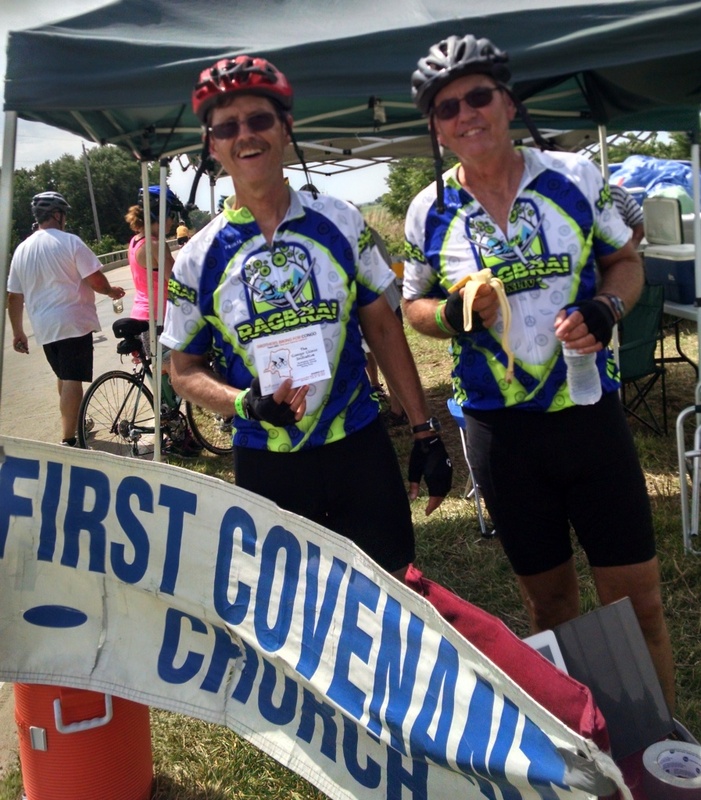 Dennis Carlson, associate pastor of Faith Covenant Church in Farmington, MI, and his brother, Rod Carlson, participated in the 420-mile RAGBRAI XLIV, The (Des Moines) Register’s Annual Great Bicycle Ride Across Iowa, to raise support for the Congo Clinic Initiative. 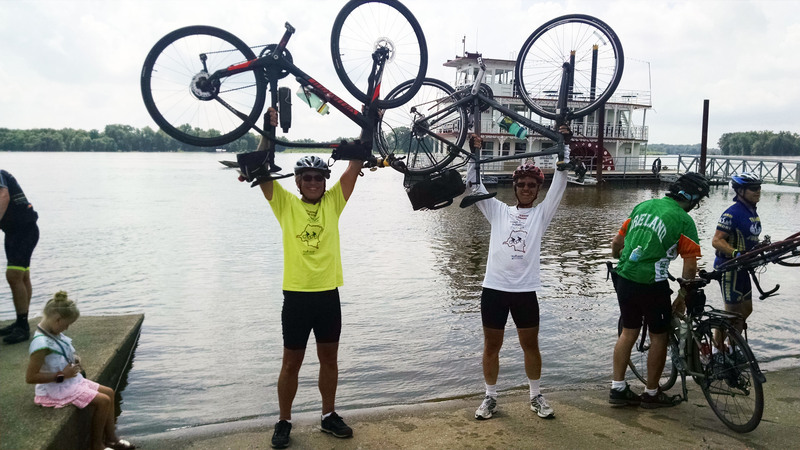 Some 10,000 cyclists participated in the race, and in keeping with tradition, the race begins with bikers having their rear wheel in the Missouri river at Glenwood, Iowa, and ends with riders dipping their front tires in the Mississippi River at Muscatine. The duo slept one night on patio cushions on the basement floor of the Evangelical Church of Centerville, Iowa, and also met up with members from First Covenant Church of Red Oak, Iowa on the first day and Faith Covenant Church in Essex, Iowa on the second day, when the congregation was serving cyclists in various ways. “We rode an average of 60 miles/day, anywhere from 49.7 to 75.2 official miles each day, probably a bit farther once we found our way around the overnight towns to where we were sleeping. One of the great myths is that Iowa is flat! In fact, over the course of seven days, we climbed 18,488 feet in elevation—3,994 of them in a single day,” said Dennis. 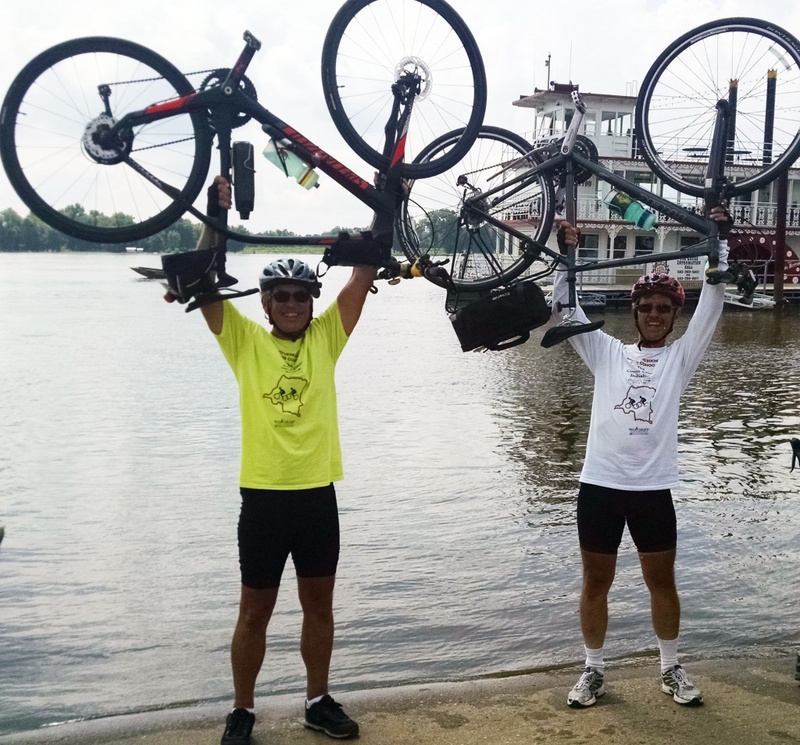 Thank you, Dennis and Rod, and all of your generous family, friends, and supporters who prayed, donated, encouraged, and followed you on your RAGBRAI journey! 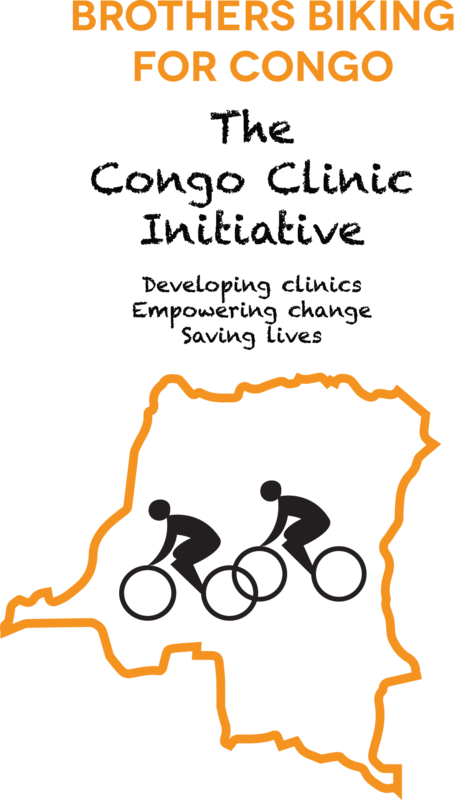 From all of us at Paul Carlson Partnership, and our partners in Congo, merci mingi! Thank you! Rod (left) and Dennis Carlson (right) do the official dipping of their front tires in the Mississippi River at Muscatine, Iowa. 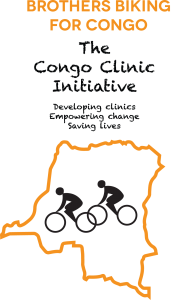 Posted in Congo Clinic Initiative, Fundraising Ideas, PCP Update.